Actions by the Chinese Communist government, including editing the Ten Commandments, retranslating Bibles, and decking church sanctuaries with national flags and images of national leaders, have all been cited as examples of the pressure being put on churches. He said: “Put the photos of 1930s German church sanctuaries and 2019 Chinese church sanctuaries side by side. Put the speeches of the leaders and officials side by side. The similarities are striking. The CEO is not alone in comparing the current situation in China with Nazi Germany. “Think Stalin and Hitler, not Mao,” said the Rev Dr Bob Fu, founder and director of China Aid, a US-based organisation that helps Chinese Christians and reports on human rights and religious freedom developments in China. “China is now taking a page from the 1930s totalitarian playbook. The Rev Dr Bob Fu has signed an appeal to the Chinese government for imprisoned members of the Early Rain Covenant Church in Chengdu, Sichuan Province. 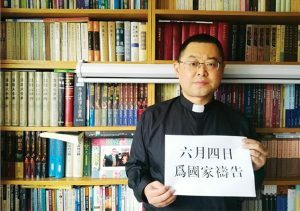 Police took 100 Christians captive from the church in December, including Pastor Wang Yi and his wife Jiang Rong. On 24 February another 44 church members were taken, including “kids, seniors and pregnant women”. Pastor Wang’s 74-year-old mother was “humiliated and beaten by police”. The youngest captive held at Chengdu police station is two months old.